An improving financial picture for Qantas’s international operations has moved the airline one step closer to a decision on whether to take up any of its 50-odd options and purchase rights for the Boeing 787 Dreamliner. Qantas International reported underlying earnings before interest and tax of $59 million for the six months to December 31 2014, a turnaround of more than $300 million from the $262 million loss in the prior corresponding period. “Qantas International was profitable for the first time since the GFC,” Qantas chief executive Alan Joyce told reporters at the company’s first half results presentation in Sydney on Thursday. Keys to the improved result were the benefits gained from Qantas’s three-year $2 billion cost reduction and transformation program. Qantas said its international operations lowered comparable unit costs 3.8 per cent, improved revenue 4.8 per cent to $2.748 billion and kept its aircraft in the air longer through higher asset utilisation and more seasonal flying. Market conditions were also helping, given flat international capacity growth in to and out of Australia. Qantas said in a slide presentation accompanying its first half results international capacity growth would slow from 9.5 per cent in 2013/14 to about 1-2 per cent in the current financial year. A profitable international arm would satisfy one of the conditions for any potential order for Dreamliners painted with the red tails of Qantas mainline. Another was to pay down debt and in that regard the company was also making progress, with net debt reduced by a further $306 million in the first half and more expected in the second half on the way to meeting a $1 billion net debt reduction target by the end of 2014/15. Joyce said the company also had to make the business case for the aircraft in the Qantas fleet, which involved negotiations with staff. “We are talking to our employees about getting that aircraft business case to work for us going forward,” Joyce said. “We are in good dialogue with our employee groups on that. 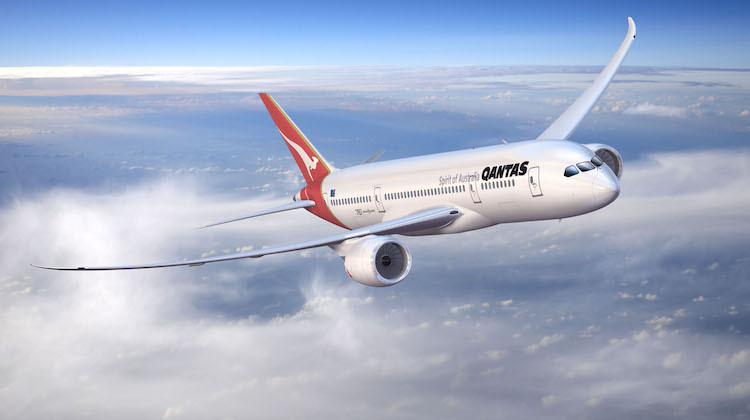 Qantas chief financial officer Gareth Evans, who will soon take up his new role at the company as chief executive of Qantas International, said the options and purchase rights for the 787 gave the airline “complete flexibility”. “There is no pressure on us in terms of timing,” Evans said. Qantas’s low-cost subsidiary Jetstar has taken delivery of eight 787-8 aircraft, with a further three due to arrive before the end of September. I’d imagine a few of these on the domestic side running east-coast to Perth would make Virgin a little un-easy. Dreamliners painted in Qantas mainline livery look fantastic. Aren’t Qantas lucky that Boeing is generous enough to offer ‘complete flexibility’! with twin engines aircrafts. Airbus and Boeing in future is capable to delivery twins, which can fly non stop destination such as Sydney to London, Sydney to New York, or Sydney-Rio, perhaps. With capacity up to 350 people on board and economy should be good move to celebrating great 100 years of QANTAS AIRWAYS. centaury of proud ROO. Good will of people and time will tel. To raising QANTAS and those people who serving and flying, have great greeting . Great news! Hopefully the 787s will have the new a330 product! Always keep in mind that on a 20h flight you have to carry the fuel for the last hour for 19 hours. This will never pay out for normal fare paying passengers. “Joyce said the company also had to make the business case for the aircraft in the Qantas fleet, which involved negotiations with staff. So that we can afford an expensive brand new aircraft which will impress our customers more, save fuel, and maintenance costs and still maintain our outrageous management bonuses, we would like the employees to take a pay cut. About time too.The extra capacity will work well for the smaller cities when Qantas needs the wide bodies for the Football or Cricket seasons on their domestic network.Their current solution when the 767’s were phased out not so long ago of adding on an additional 737 does not work so well. When they do finally order them I wonder if the boffins will finally wake up to the fact that many people from ADELAIDE do actually fly to Asia. Pity we can’t even consider using Qantas.